erent characters. 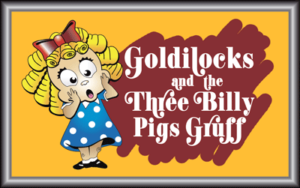 She challenges the villains: Goldilocks, Big Bad Wolf, and The Troll to make good choices. If they don’t, they must take a chain and be bound to their bad choices. Some of them rise to the occasion; some don’t, but they learn that they have the power to be kind and respectful, and that second chances are possible. This is one of our favorite shows to offer with fun costuming, some silly casting choices, amazing original music and smart writing. Teachers beg for us to bring this back! RHYME, COMMUNITY, RELATIONSHIPS, and has ANTI-BULLYING themes. Tickets are $10.00 per student for groups of 20 people or more. Receive one complimentary chaperone ticket for every ten tickets purchased. Performances 10:00am or 12:00pm Monday, Tuesday, Thursday & Fridays. To check availability for a specific date please contact our youth theatre office.